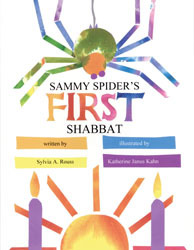 Curious as ever, Sammy watched the Shapiros prepare for Shabbat, Though his mother says, "Spiders don't celebrate Shabbat. Spiders spin webs," Sammy unexpectedly finds his own special way to observe the holiday. Inludes blessings and a step-by-step recipe for challah.